Richard Hobbs left and Kevin James right receiving their medals earlier on in the week. Image courtesy of the Council of the Isles of Scilly. Two firefighters in the Isles of Scilly have been awarded Long Service Medals in recognition for 20 years' of service and good conduct. Watch Managers, Kevin James of St Mary’s and Richard Hobbs of Tresco received their medals this week. The announcement of Kevin's and Richard's achievement was posted as part of an update from Station Officer, Declan Ridsdale on the Council of the Isles scilly's website. Declan said: "As we move towards another winter, I want to thank everybody involved in the islands’ Fire & Rescue Service for their commitment and work in keeping our islands safe. We have had a relatively quiet year, with the exception of the fire at Peninnis Farm and the great fire of Gugh. However, both of these incidents have tested the resilience and resources of the Service and I am impressed with how the teams have responded." 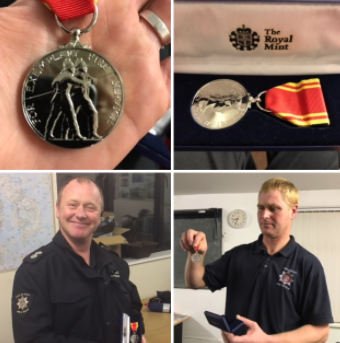 He added: "I’d like to say a big thank you to Watch Managers, Kevin James (St Mary’s) and Richard Hobbs (Tresco), who have both received Fire Brigade Long Service Medals in recognition of 20 years’ service and good conduct." Over the winter months the Isles of Scilly Fire & Rescue Service will be carrying out their winter training programme with recruits taking part in their initial training course. The Isles of Scilly Fire & Rescue Service would like to remind all residents that the Service carries out free home fire safety checks. During their visits they provide advice and check properties for general fire safety including alarms and electrical equipment. They can also provide smoke and carbon monoxide alarms where necessary. 01720 424331. Alternatively you can email fire@scilly.gov.uk.